No, not the Asgardians of Norse legend and of MCU fame, but the newest additions to our homestead. 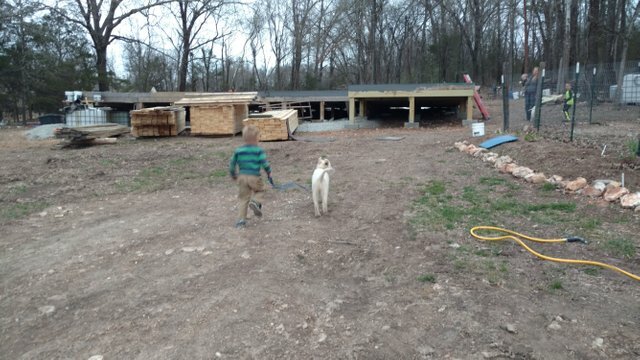 A while back we made a post about having to find different homes for the two dogs that we had on our homestead. Loki (our Bull Mastiff) and Tygra (our Heinz-57 mutt) were lovely pets, but definitely did not have the pedigree to be LGD's (Livestock Guardian Dogs). Let's just say that they liked the taste of chicken and rabbit too much... I certaintly can't blame them because, I mean, who doesn't? Right? We found good homes for our beautiful, yet predatory dogs, and felt some relief knowing that they wouldn't be killing any more of our animals. That sense of relief only lasted for a few months. The onset of Spring brought warmer weather and the inevitable four legged predators to terrorize our previously unmolested duck flock. 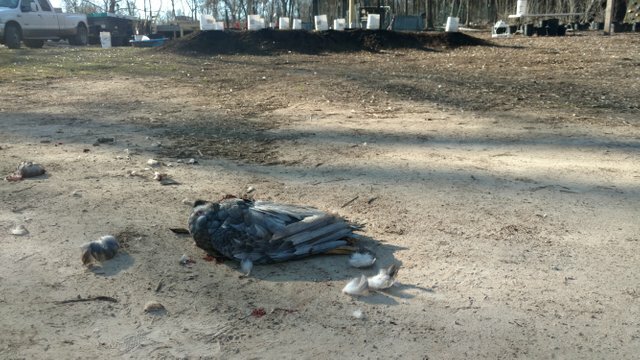 We lost about 6 birds over a span of 4 days to a combination of raccoons and possums. Fortunately, some late night stake outs with my oldest son, some live traps properly placed around the land and a radio playing music throughout the night has kept the little terrorists away ever since. 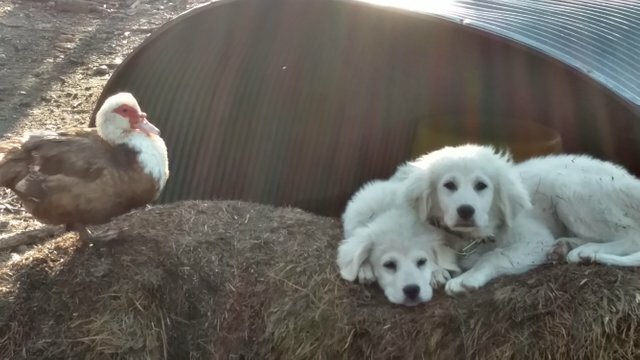 Not satisfied with relying on just the radio and not having the time to build a safe and secure coop, we opted to pick up a couple of new puppies that had the "protect the flock" gene already hardwired into them. We found an ad for such puppies on the community wall at a local feed store and jumped on the chance to get them. They are a brother and sister pair. Their mom is 3/4 Great Pyrenees and 1/4 Austrian Shepherd while their dad is 100% Great Pyrenees. 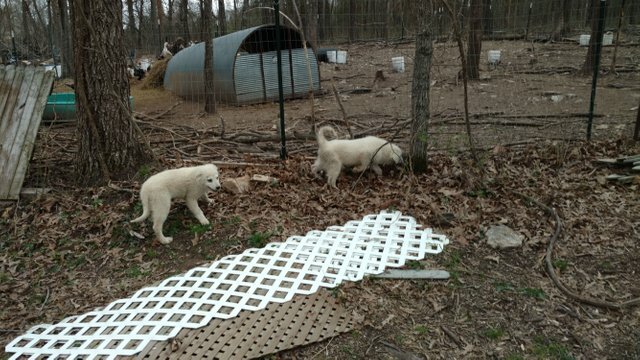 Right from the get go, the differences between our old dogs and these new 12 week old puppies were noticeable. For one, Thor and Lady Sif didn't try to "mouth" you when you went to pet them. Our old dogs couldn't keep their mouths off of our hands, always trying to playfully bite us. The next major difference we noticed is the lack of "prey drive" that the new puppies have been exhibiting. Loki and Tygra had to constantly be scolded for paying too much attention to the rabbits and when a chicken or duck would fly into their fenced in yard it usually didn't end well for that bird. Thor and Lady Sif, on the other hand, pay no attention to the ducks that they share the old dog yard with. 2 weeks of cohabitation and not even one sideways glance towards the ducks has come from these pups. The last major difference we've notices is the natural monitoring that these LGD's display on a daily basis. When one is sleeping, the other will stand guard. It's rather quite remarkable. The other night I heard Thor barking a little different than I've heard him bark before. I got up from bed and went out with a flash light to see what was going on. Much to my delight I saw Thor and Lady Sif standing at attention with their faces looking out into the dark forest beyond their yard. I shone my light in the same direction they were looking and I saw a raccoon making a hasty retreat into the depths of the forest. It wasn't until the little duck slayer was completely gone from view that the pups turned their gaze onto me with excited wags of their tails. I praised them for being good dogs and for protecting their charges. They seemed pleased that I was pleased with their performance. I'm still amazed at how ingrained the shepherding and protecting genes are in to these now 14 week old puppies. No training, just raw instincts. If I hadn't recommended LGD's to before, I highly do now. 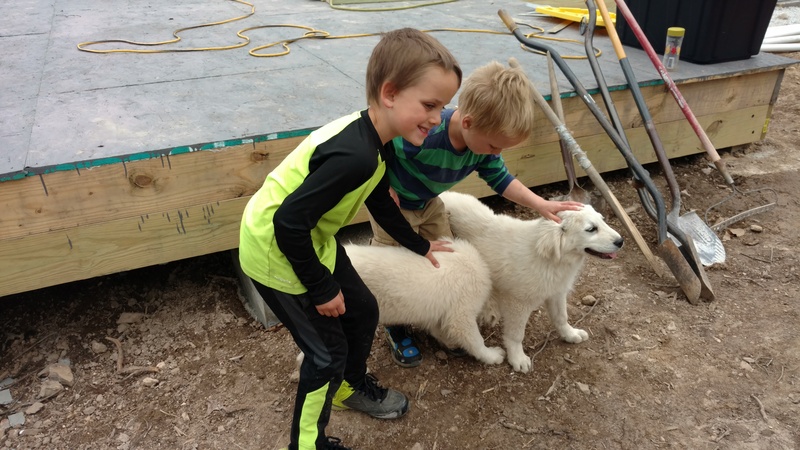 Every homesteader should have a couple of these wonderful dogs on their property. Keeping cattle by making dogs as guard animals is a very good thing. 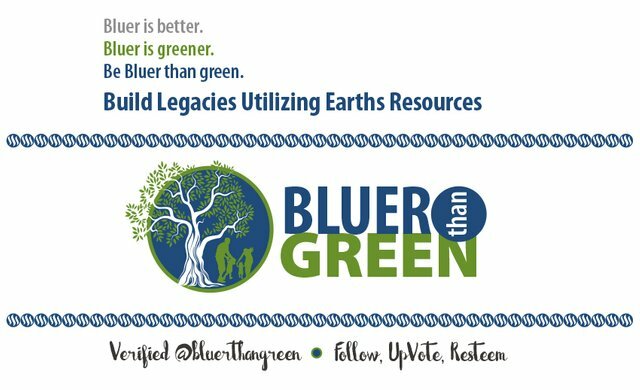 you just put the lie to 'don't buy...adopt'. 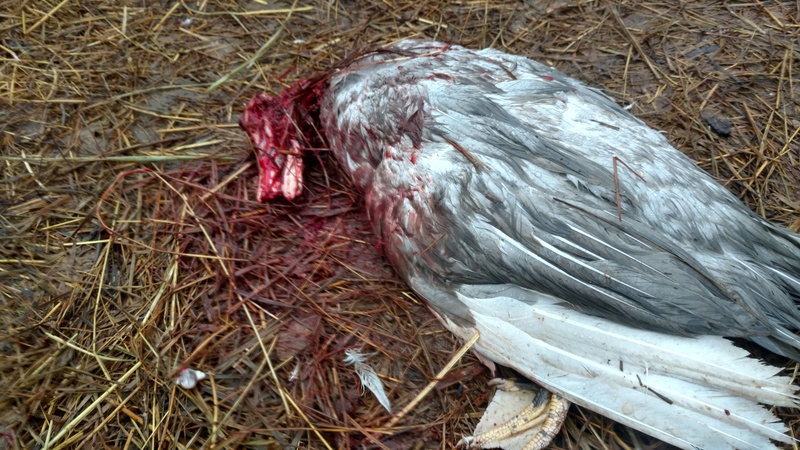 if ANY dog hurt one of the flock that they were guarding...it was killed...and all of it's brothers, sisters, and cousins were killed also..
for THOUSANDS years back into the dawn of pre history this practice was followed. what you got is the result. All dogs are not alike..they've been bred for different task. you picked some good ones it looks like. 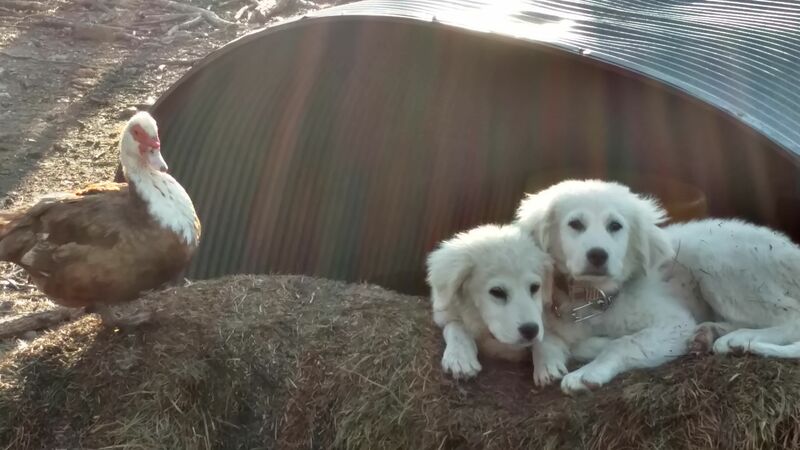 Great Pyrenees make a great livestock guardian dogs. Just keep an eye on them and keep them around the livestock they are suppossed to protect. Great choice of pups! They will do a really good job keeping those vermin away! I missed this post from ... 10 days ago! Really cool dogs you got, and it's awesome that they protect the flock. Do you let them run wild and free 24/7? Or do you fence them in at night?